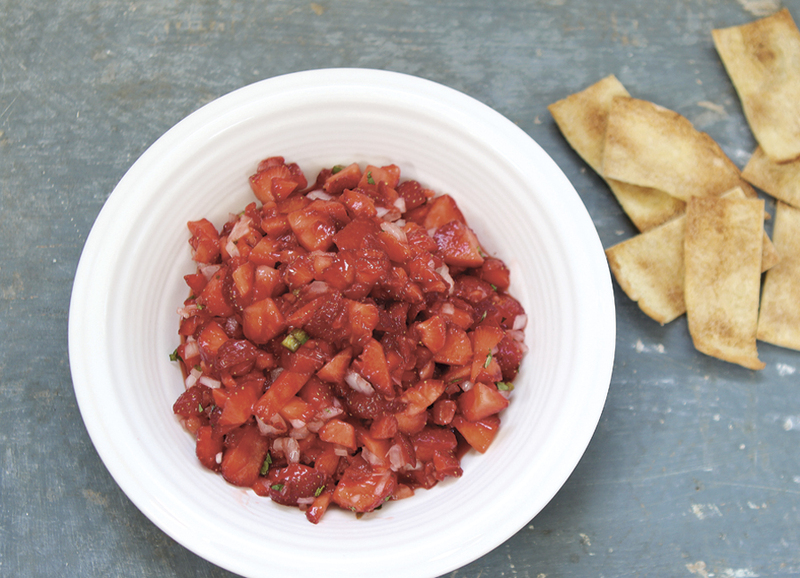 This salsa of fresh summer strawberries is a showstopper, especially when paired with these sweet pita chips dusted with cinnamon and sugar. As with any salsa, you can adjust the desired level of spice to your own liking by adding in more jalapeño or even leaving in some of the seeds (where the real spice is). This salsa is best made right before you serve it, but if you need to make it ahead of time, just drain any excess liquid from the bottom of the bowl (the fresher the strawberries, the more liquid will accumulate). Make sugared pita chips. In a small saucepan, melt butter. Using a sharp knife, gently split open edges of each pita at its seam, separating each into two rounds. Using a pastry brush, gently brush melted butter on coarse inner side of each round. Sprinkle tops with a little bit of cinnamon sugar. Repeat with remaining pita rounds. Cut each round into desired shapes. Spread pitas out in a single layer onto 1-2 baking sheets. Bake until golden brown, about 3-4 minutes. Set aside to cool. Make salsa. In a medium bowl, add strawberries, onion, jalapeño, mint (or cilantro), a pinch of salt, and lime juice from 1/2 lime and gently toss together until combined. Adjust seasonings, adding in more lime juice if necessary. Transfer to a serving bowl and serve with chips. Recipe from: The Coastal Table: Recipes Inspired by the Farmlands and Seaside of Southern New England. Published by Union Park Press, 2013. For more great recipes, check out our summer ’15 issue.